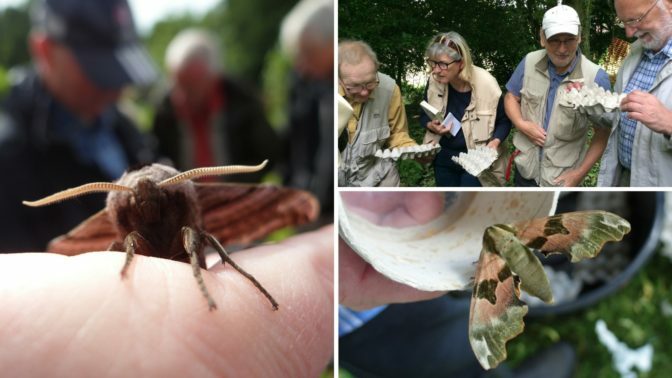 World renowned butterfly and moth expert and author David Brown leads a week of field trips, workshops and lectures focusing on rare and interesting late summer butterflies and moths of Somerset. Field visits will include a trip to the Blackdown Hills to study the nationally important Brown Hairstreak, while light traps will be operated in the grounds of the Manor where the declining Hedge Rustic is a local speciality. Illustrated evening talks will help sharpen identification skills and provide knowledge on the ecology of selected species. This course is open to anyone who would like to know more about butterflies and moths. There will be field trips – whatever the weather! – so please bring suitable clothing and footwear for walking outdoors. David Brown has enjoyed a life-long passion for butterflies and moths. Several decades have been spent exploring lepidoptera-rich habitats throughout the British Isles, leading to extensive studies of all the British species of macrolepidoptera in addition to many scarce immigrants. David has been Warwickshire County Recorder for larger moths since 1971 and also serves as the County’s Moth Conservation Officer. Over many years, he has tutored successful adult classes at both Warwick and Birmingham Universities and currently runs residential courses throughout the British Isles for the Field Studies Council and Adult Residential Colleges Association. Other work has involved lepidoptera surveys for ecological consultants, English Nature and Forestry Commission. David writes regularly for the National journal ‘Atropos’ and has been a member of the editorial panel since its inauguration. Arrive Monday afternoon from 4pm, depart Friday morning. Please note that there may be alterations to the timings of the field trips to make best use of the weather conditions. 12.00 Analysis, results and conclusions.